There was a time, around a few thousand years ago, that God would talk to us. Sometimes He would say something from behind a burning bush. Sometimes He would appear in a dream. Sometimes He would give us his words in the field of battle and sometimes He would just send his son down to the earth. Then, for some reason, God became silent, round about the time Man started this whole “science” thing. Now once again, after years, he has spoken, this time through a new prophet. Not surprisingly, the chosen one happens to be a Bengali by the name of Boria Majumdar. I apologize for the blasphemy I am going to commit right now. But I have to say it. Prophet Boria’s prose is, for the want of a less obvious word, boring. Not to sully the purity of His words, but one wishes that He had chosen a more accomplished spinner of sentences, someone like Rahul Bhattacharya for instance, who would have been less liberal with passages that sound like paraphrasing of score-cards. But perhaps I am wrong. God knows best. Perhaps only Mr. Boria would have been able to capture the voice of God without superimposing his own. Perhaps each exclamation point was an “Ailaaa”, and God does indeed remember how many balls he faced and how many runs he scored of matches played decades ago. Because, truth be told, “Playing It My Way” is authentically Sachin. (Note: I shall from now use the word “Sachin” interchangeably with God). There is deference to higher authority, namely the BCCI for even Sachin has His Gods. There is predictable silence on the contentious stuff. The Ferrari. Vinod Kambli’s outburst. The match-fixing that was taking all around him. Needless to say, there is much carping on the interwebs for his silence on the latter. The problem in being God is that the infidels always carp. If he had said something about fixing, then the retort would have been “Why did he wait till his autobiography to say this? He is just creating controversy to sell his book”. Now that he has not, they are still pitchforking him. Damned if you do, damned if you don’t. See that’s the problem. Whatever He does, God can’t win. And that’s often been the greatest criticism of Sachin, that he does not make India win, something He lets go outside the off-stuff without a retort. There is some controversy of course, but even here, Sachin has gone for Henry Olonga-like easy targets. Greg Chappell is the big bad wolf, as are Gilchrist, Ian Chappell, assorted Australians and that English match-referee who denied God. Well I take that back. There is one rather dramatic beef with another God, a kind of Zeus vs Hades, that is never quite as front-and-center as the lightning strikes on Greg Chappell, but simmers and smokes throughout. I shall not “declare” the details here, because that would be a genuine spoiler, but suffice to say there is material for massive crusades on the Twitters, some of it I see has already begun. But then when has a Holy Book not been contentious? 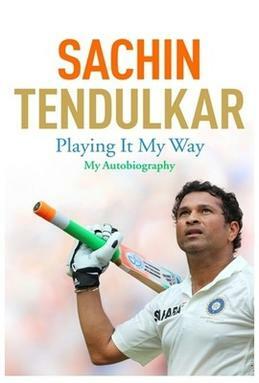 “Playing It My Way” works (mostly) because it is this voice of Sachin that comes out strong and clear, despite the exclamation marks, the stilted prose and the unimaginative retelling of that-which-everyone-knows. There are remarkable insights into batting techniques. Though absolutely non-controversial, unlike a certain Sunil Gavaskar revelation in “One Day Wonders”, there are many personal anecdotes—of how he wooed Anjali, of his son resenting his prolonged absences, of self-doubt, anxiety, loss and fear. Even his broadsides against those who he feels have hurt him just goes to show that even God, with all the adulation and worship, can never forget a slight. And then finally there is my favorite, where he impulsively lets himself stumped after being beaten by a bowler who is hearing-impaired, even though the keeper flubs the chance the first time. It’s these that make “Playing It My Way” worth a read. You know the places where God appears a bit…human. Over the years I have come to realize that my non-reverence of Sachin is more because of his fans rather than the various shortcomings attributed to him. Having said that, the “God’s” silence over crucial matters in the 2 decades gone by, was sometimes deafening!!! About the Hades beefup , don’t you think both parties are at fault. Hades for declaring a war against Zeus in the first place . And Zeus for not being able to forget it even now after 10 ages. For all you know, this whole idea of autobiography must’ve been something that he couldn’t avoid, just like the way a celebrity can not avoid being noticed. Hence the “silences”….doesn’t mean we should point fingers at him now….he’s been phenomenal and will always remain so….lets accept it and appreciate it. PS: Not sure if I should say this but even Gods have privacy….and the right to remain silent. Amazing I have read his Biography. Want to become like him. Thanks for sharing this. But the God has spoken what was in his underwear. What more do you want? you must watch Ramdhanu -The Rainbow. Its such a nice movie. Good for new parents. Sachin Tendulkar is not an intellectual. He is a great batsman, a very good bowler and a good fielder. That’s it. I still feel nation overdid ‘Sachin is God’, nonetheless he is one of great cricketer country has produced so far. Just starting reading this….Came here searching for article on DDLJ. No good articles in media on a movie which made an entire generation eternal romantics. Greatbong please write one .. I stopped liking this guy Sachin Tendulkar somewhere in the mid-90’s and stopped watching cricket because of him. I do not have any respect, admiration or whatsoever for this guy, as I have found him to be utterly selfish, self-promoting and completely useless towards the glory of Team India.